Mr.Pickles is doing really great! He is adored and I cant thank you enough for sending him my way. He (along with my girls) make me very happy. Life can’t get much better than this! I feel like a new Pug and live like a pug really should. I am enjoying life with my new family so very much. I feel better I look better and I am so happy. My new mom cuddles and kisses me all the time which I just love. I have 2 pug sisters who have included me in the group with no problem; they even let me curl up on the big pillow our mom puts on the floor. Even the big fat cat Willie is starting to accept that I’m here to stay. When I first came to my new home I had lots of things wrong with me, things didn’t really look that good for me and I needed a lot of care-even a blood transfusion! My new family did everything the doctors and the nice pug lady suggested. Little by little with lots and love and let’s not forget good food (cause I was really skinny) I began to come around. Now I’m a new man. 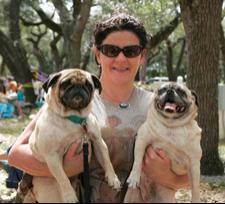 I am so lucky to have been given to the nice pug lady because most other people would not have seen any hope with me. I got a second chance and I couldn’t be happier. Thanks for a new start!